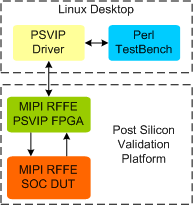 MIPI RFFE Post Silicon Validation IP provides a smart way to post silicon validation of the MIPI RFFE component of a SOC. MIPI RFFE Post Silicon Validation IP provides an smart way to post silicon validation of the MIPI RFFE bi-directional two-wire bus. The SmartDV's MIPI RFFE Post Silicon Validation IP is fully compliant with version 1.0,2.0,2.1 MIPI Alliance specification for RF Front-End Control Interface and provides the following features. Supports 1.0,2.0 and 2.1 MIPI RFFE Specification. Supports Full MIPI RFFE Master and Slave functionality. Operates as a Master, Slave, or both. Supports all topologies as per the MIPI RFFE specification. Supports interrupt summary and identification command sequence. Support Master write and read sequence. SmartDV's MIPI RFFE Post Silicon Validation IP env contains following.